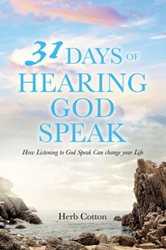 Within the pages of Herb Cotton’s new book, 31 Days of Hearing God Speak, ($11.49, paperback, 9781545620045) readers will find a month-long Bible-based daily devotional. Through including the author’s inspiring lessons from his life, the book encourages daily Bible reading, prayer and spiritual growth. Herb Cotton is a transitional pastor, deacon, radio host, intercessory prayer and president of Alaska Baptist Convention. Xulon Press, a division of Salem Media Group, is the world’s largest Christian self-publisher, with more than 12,000 titles published to date. Retailers may order 31 Days of Hearing God Speak through Ingram Book Company and/or Spring Arbor Book Distributors. The book is available online through xulonpress.com/bookstore, amazon.com and barnesandnoble.com.